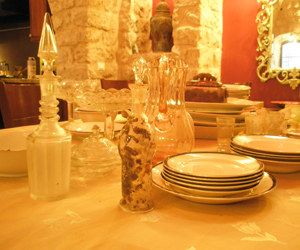 Perched above the town on Har Canaan you will find another one of Safed's hidden surprises, the Gan Eden restaurant. It has a small, boutique-style restaurant feel, although it actually seats up to 60 outside, and 40 inside in a choice of four intimate rooms. In the summer, you can enjoy the view of Meron from the shaded garden deck, and in the winter you have the pleasure of a wood burning stove to keep you warm inside. This restaurant, run by the Brigel family, aims for quality and certainly delivers it, both in the décor and in the food. With chandeliers hanging from the ceiling, prints and photographs on the walls, mosaic floor tiles and proper tablecloths on the tables, Gan Eden is the place to go for a special occasion. The anti-pasti salads offered include an aromatic tomato and fresh basil mix, char-grilled peppers and wonderful olives. However, you may prefer to choose the delicious cheese filled dumplings (29shks) or decide to share one of the main course salads (from 47shks) like the stir fried halumi cheese with fresh figs over lettuce, tomatoes and mushrooms, as a first course instead. If you are want to try something a bit different than the regular pasta choices (from 49shks), why not try the more unusual sweet potato ravioli in a cream sauce with raisins? Or, if you can spare the calories, go for the filo pastry stuffed with mushrooms, vegetables or Swiss chard (59shks) which will simply melt in your mouth. If you prefer fish, the variety of baked fish dishes offered by the Gan Eden is second to none. Apart from the more normal Salmon, they also have a choice of Sea Bream and Sea Bass, which is usually difficult to find elsewhere. These are all served with a choice of baked potatoes or herb rice, green salad and vegetables (81shks). The desserts (28-32shks) on display in the chill cabinet are difficult to resist, so why not share one and that way you won't feel so guilty? Whether you choose the cheesecake, the apple cake or the three chocolate cake, something sweet will certainly round off your meal. There is a private room that can host up to 10 guests for a private party or you can book the whole restaurant in advance for a function or large group. There is a choice of special group menus available or you can order a la carte if you prefer. The restaurant is open for breakfast (100shks for two) lunch and dinner. Sunday to Thursday 9.00am - 11.00pm all year round , Fridays from 9.00am - 2.00pm. By Car: Take the Hagedud HaShelishi road up towards the Canaan Spa Hotel and it is on your right, next door to the Villa Galilee Hotel. By Bus: take the no 3 and get off the second stop after the Canaan Shopping Mall.